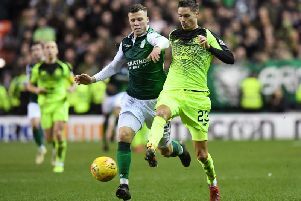 Hibs boss Neil Lennon has revealed he’ll be having talks with Lithuanian international midfielder Vykintas Slivka today while confirming the Easter Road club have made striker Anthony Stokes a firm offer. Only 48 hours ago, Lennon snapped up Lithuanian striker Deivydas Matulevicius on a two-year deal and is now set to make his countryman his seventh signing of the summer. Slivka has been with Italian giants Juventus since 2014 but has been on loan at a number of clubs including Dutch outfit Den Bosch. The 22-year-old midfielder has won 19 caps for his country. Lennon, meantime, insisted the ball was very much in Stokes’ court, the Republic of Ireland player having negotiated his release from Blackburn Rovers. He has been widely touted for a return to Easter Road for a third time but now the decision is his. Meanwhile, Lennon was delighted with his side’s performance although they lost their Betfred Cup match against Ross County on penalties following a no-scoring draw in Dingwall. Steven Whittaker and Oli Shaw saw Staggies goalkeeper Scott Fox save their efforts from the spot, County winning 4-3 and topping Group D with eight points to Hibs’ four although the Capital club have two more games to the Highlanders’ one. Darren McGregor hit the bar with a last-gasp header seconds after Boyle had seen Fox pull off a point-blank save after he’d been put through, leading Lennon to say: “We rained shots on them all night. My goalkeeper didn’t have much to do so it was a dominant performance without the final touch but I am sure that will come. “Steven Whittaker and Efe Ambrose got the full 90 minutes and it will do the rest of them the world of good.